When it comes to customer service in field service industries, sometimes you have to go rogue. Strike where the competition lags. Be bold amongst the crowd. Today, there’s no easier way for field service companies to be extraordinary and see massive improvements in customer service and operations productivity than to implement a mobile payment system. A mobile payment system allows field service employees to accept credit card transactions using a mobile device, such as an iPhone or Android smart phone. You can receive payments in mere seconds from any location. It’s a new brand of customer convenience in the field or on the road. Surprisingly, Forrester Research predicts that mobile payments are still “three to five years away from becoming mainstream.” While companies in Europe and Asia have been utilizing mobile payment solutions for almost a decade, North America has been slow to adopt the “new” technology. However, Mashable.com contributor Christina Warren predicts that even if the movement doesn’t take off overnight, “mobile payment systems are still poised to help redefine the way business is done all over the world.” Kick off those old-school methods of billing and payments, and get an edge on the competition. In five years, they’ll be panting to catch up! A mobile credit card payment option opens up a whole new avenue of customer convenience and Point of Sale opportunities. Field employees can influence purchasing decisions and add services on the fly. Those facts and figures stored in the corporate office-billing histories, addresses, and credit card information-are now available from your field worker’s smart phone. This allows for a more customized customer experience, and improves operations efficiency on the road. No more paper invoices, stamps, envelopes, and check stubs to issue and file. Boost your environmental credibility and cut costs at the same time! Payments in the field reduce accounting and invoicing costs, cutting the order-to-cash and cash-to-cash cycle times dramatically. 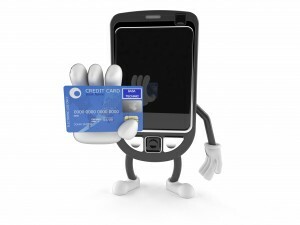 Most mobile payment solutions are contract-free and allow you to operate on a transaction-to-transaction basis. You can expect to pay between 1.7-2.75% per transaction. Today, mobile payment solutions in the field are extraordinary, but not risky. Next week, we’ll review the top mobile payment solutions on the market, to help you assess which is best for your field service needs. You may be familiar with the Square mobile pay system-but have you heard what they’re doing with Starbucks?